A 68-year-old male patient presented with the history of angina on routine activities NYHA-II for the last 2 years. After investigations, he was found to have coronary artery disease and was posted for off-pump coronary artery bypass (CABG). 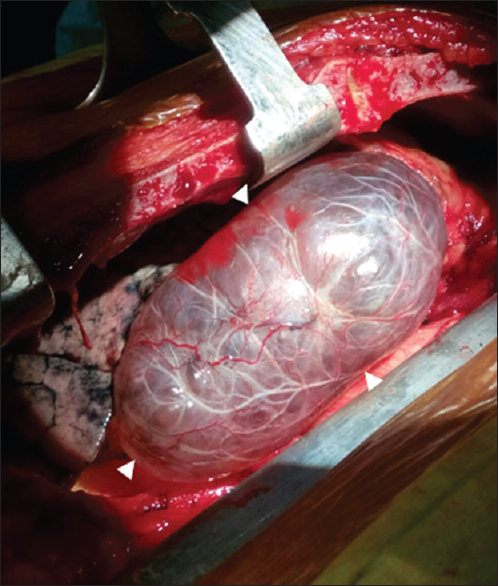 After median sternotomy when pleura was opened for harvesting right internal mammary artery, a large bulla [Figure 2] was found in the right upper lobe of the lung although the preoperative pulmonary function tests of the patient were normal. After completing the anastomosis of off-pump CABG, bullectomy was done. 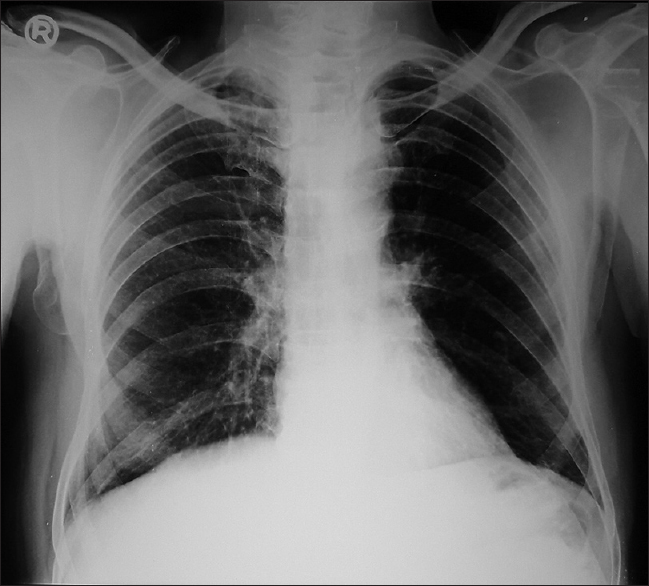 When the chest X-ray (CXR) of the patient was looked up, CXR posteroanterior (PA) view [Figure 3] did not reveal any findings of bulla, while CXR lateral view [Figure 1] had a large hyperlucent region behind the sternum. Earlier, we could not make out the etiology of hyperlucent lesion in CXR lateral view; however, after opening of pleura, we realized that it corresponded to the large bulla of right upper lobe of the lung. A pulmonary bulla is a thin-walled air-filled space of >1 cm in diameter, occurring distally at terminal bronchiole. They are caused by loss of alveolar structural tissue. Most of the patients with bulla have a history of cigarette smoking, although cocaine smoking pulmonary sarcoidosis, Marfan syndrome, Ehler–Danlos syndrome, alpha-1 antitrypsin deficiency, and glass fiber exposure have been implicated. In a prospective study by Lone et al., the incidence of bullous lung disease was approximately 21.6 cases per year. On chest radiograph, a bulla appears as an avascular hyperlucent area, usually separated completely or partly from the remaining lung by a thin curvilinear wall. Computed tomography (CT) thorax provides more detailed information of location, size, number of bullae, and adjacent lung pleural and mediastinal structure. When the positive pressure is applied, the intra-bulla pressure rises in relation to surrounding lung region, and there is risk of hyperinflation and rupture resulting in tension pneumothorax. Pulmonary bulla commonly tends to gradually increase in size with worsening pulmonary function and often requiring bullectomy. 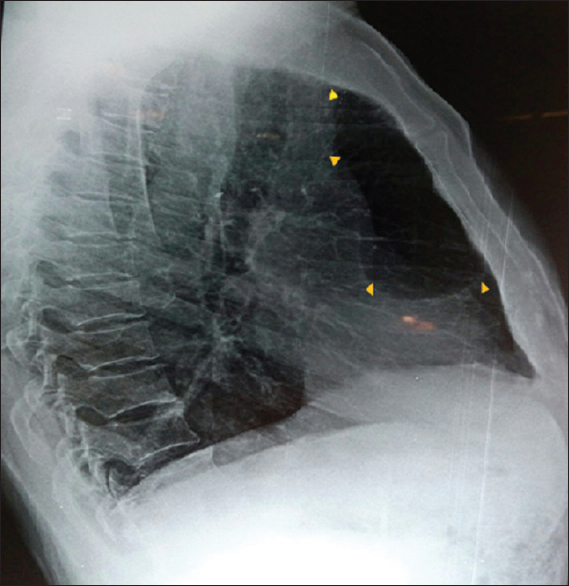 Although there is no universally accepted surgical indication for resection of lung bulla, a patient with symptomatic dyspnea, repeated infection, and giant bulla that occupies >30% of a hemithorax and in whom CT scan suggest that reasonable lung function can be restored to a more favorable anatomical position should be considered for bullectomy. Hence, CXR lateral view is an important modality for detecting cardiac and lung pathologies as some pathologies may not be evident on CXR PA view. Slinger PD, Campos JH. Anaesthesia for Thoracic Surgery: Millers Anaesthesia. 8th ed. Elsevier, 2014. Goldberg C, Carey KE. Bullous lung disease. Western J Med 2013;14:450-1. Lone YA, Dar AM, Sharma ML, Robbani I, Sarmast AH, Mushtaq E. Outcome of the surgical treatment of bullous lung disease: A prospective study. Tanaffos 2012;11:27-33. Odev K, Guler I, Altinok T, Pekcan S, Batur A, Ozbiner H. Cystic and cavitary lesions in children: Radiologic finding with pathologic correlation. J Clin Imaging Sci 2013;3:60. Wheatley GH, Estrera AS. Bullous Lung Disease CTS NET: The Cardiothoracic Surgery Network. Available from: http://www.ctsnet.org/sections/clinical resources/clinicalcases/ article-1.html. [Last accessed on 2018 Apr 16].